Perhaps it's my Montana roots or my rural upbringing (I grew up on a cattle ranch/wheat farm 'til the age of 5), or the fact that my Granddad once owned a butcher shop (Leon's Lockers)... but I'm a sucker for a mom and pop grocery store with a quality meat counter. 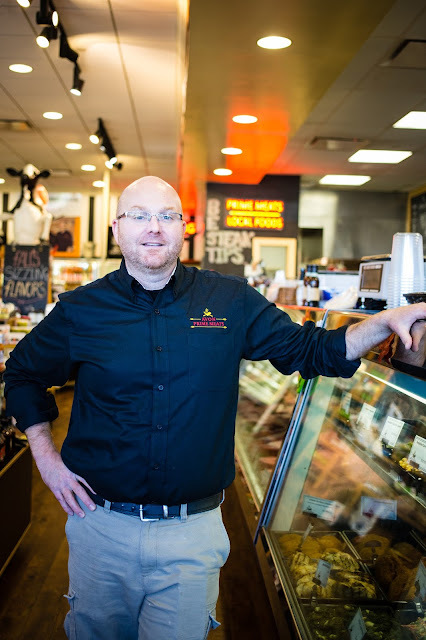 So when Matt Cormier of Avon Prime Meats reached out to me via Twitter, I jumped at the opportunity to come check out his shop. And then I was sad I didn't do it sooner. It's like Disney Land for foodies! Tons of local specialty products, an impressive prepared foods section (Matt has worked in restaurants previously), and of course some of the highest quality meats you'll find in the area. I immediately suggested collaborating on a post, and Matt insisted that wasn't his intention for inviting me to the store. He said he just wanted to get me hooked so I would come back. Well, Matt, consider me officially a loyal customer! 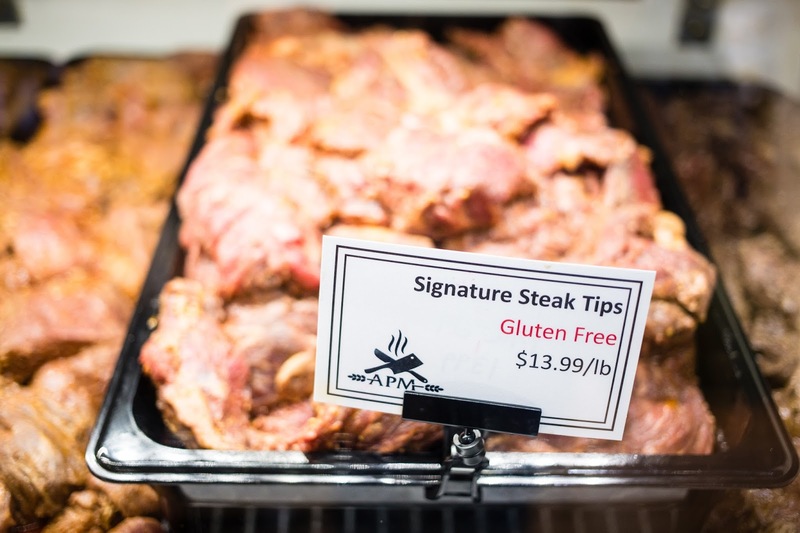 He sent me home with some of their famous marinated steak tips, along with some other goodies from the store, and we brainstormed on a blog post. 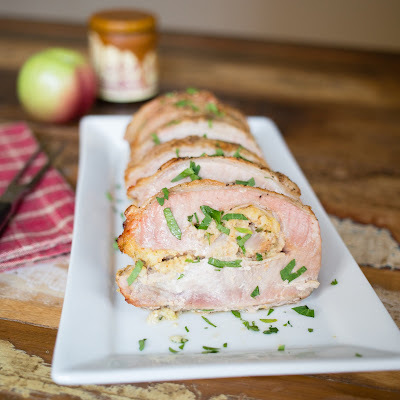 He told me another of their customer fall favorites is a caramel apple cornbread stuffed pork loin. Ummmmmm.... I was drooling. And with "A" coming around again on the blog, seemed like a match made in meat heaven. 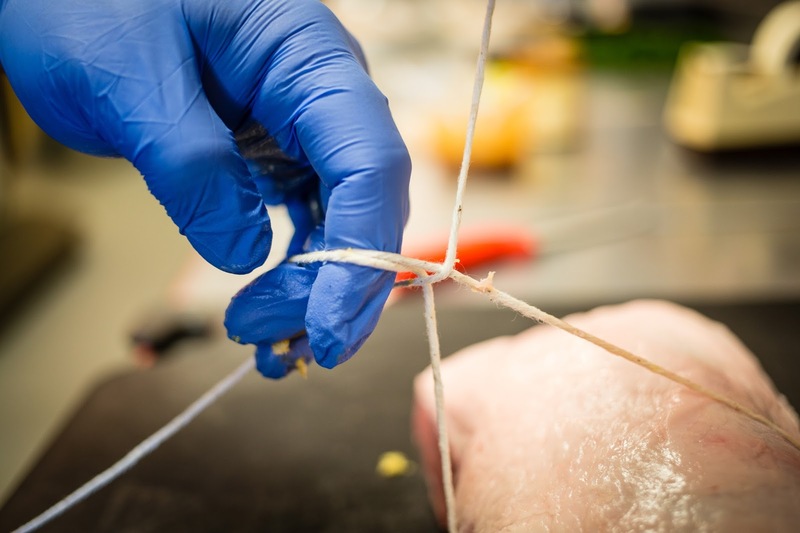 Using butcher's twine, tie the loin up to secure it. Tim says you want to make sure your knots are on the tail side (the side you didn't cut into to butterfly it). He suggests tying the middle first, and then the two ends, then adding additional knots in the middle, which will help with keeping the stuffing inside of the loin. If you can do a slip knot, that will work the best. 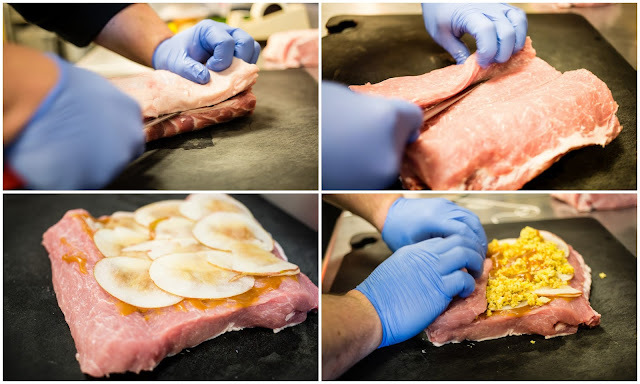 An alternate way to do this is to cut a pocket in the top of the pork loin and stuff it that way. But I just love how the rolls look when you slice them, so I went for that. Shout out to Tim for doing all the work! Season the entire outside of the pork loin with a mixture of salt, black pepper, and white pepper. Bake in the oven at 375 for 30-35 minutes per pound (so about 1:30 to 1:45 for a 3 pound loin). 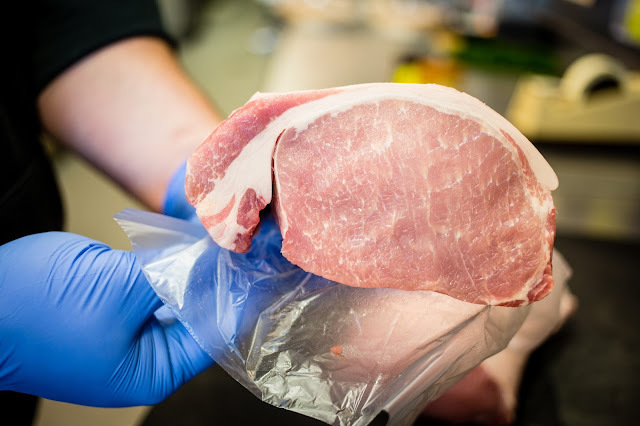 Remove from oven when pork reaches a minimum internal temperature of 145F. Cover the loin with aluminum foil, and let it rest for 10-15 minutes afterwards. Once it's rested, slice and serve! Melt butter, sweat onions and celery, add it to cornbread, add stock a little bit at a time so you don't accidentally add too much moisture to stuffing. Let it sit for 30 minutes after mixing. Put down a layer of caramel sauce first, smother it across the entire inside of the pork loin. (This will help to keep the apples and stuffing secure before you tie it up.) Put down a layer of the sliced apples next. Place a generous amount of stuffing on top of the apples, spread it out, but leave a few inches on either end of the pork loin, it will help when you fold it back up after. Tie the loin up to secure it, you want to make sure your knots are on the tail side (the side you didn't cut into to butterfly it.) I suggest tying the middle first, and then the two ends, then adding additional knots in the middle, this will help with keeping the stuffing inside of the loin. Season the entire outside of the pork loin with a mixture of salt, black pepper, and white pepper. Bake in oven at 375 for 30-35 minutes per pound (so about 1:30 to 1:45). 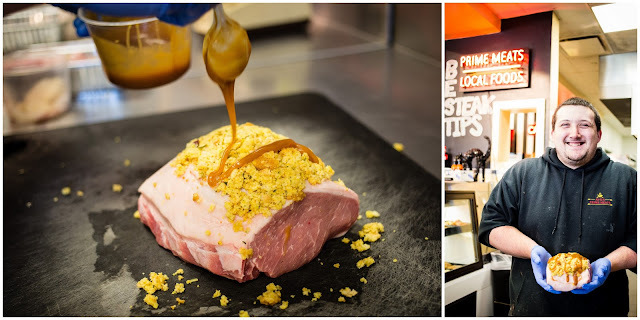 Remove from oven when pork reaches a minimum internal temperature of 145F. Cover the loin with aluminum foil, and let it rest for 10-15 minutes afterwards. Slice, garnish with parsley and serve!